The National Library of Medicine organized a two-day conference last month to highlight best practices for enhancing reproducibility of scientific research through increased rigor and transparency in reporting. Dr. Patricia Flatley Brennan emphasizes the need for consequential research at the conference. “Consequential Clinical Research: Accelerating Continuous Improvement” included 14 sessions covering such topics as enhancing the quality of clinical research studies, achieving trustworthy results, increasing transparency, and delivering benefits to patients. The conference was a follow-up to a conference in 2016 that focused on irreproducible results in preclinical research. 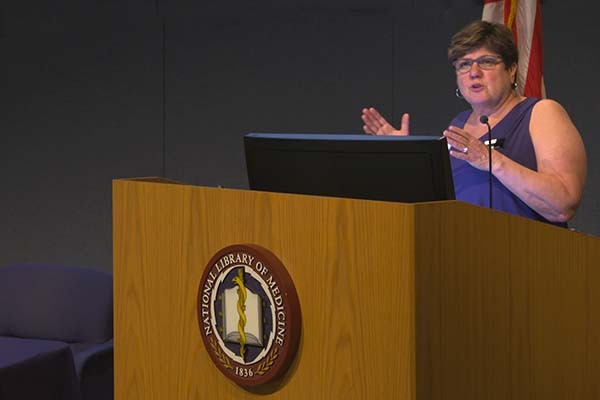 NLM Director Patricia Flatley Brennan, RN, PhD, welcomed the group on behalf of the staff of NLM who work to ensure that consequential clinical research is identifiable, accessible, and distributed around the world. 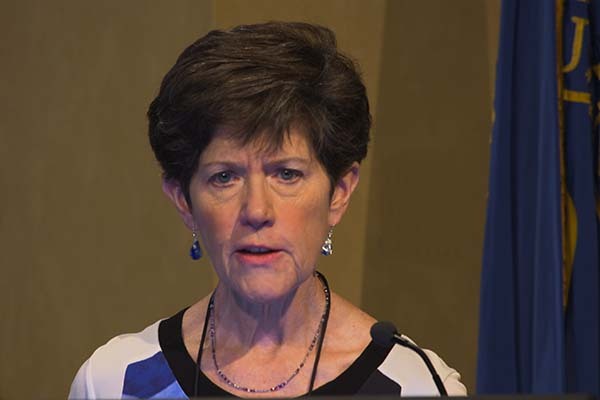 The keynote address, “What Makes Clinical Studies Consequential and Valuable?,” was delivered by Carolyn Clancy, MD, deputy undersecretary for Health for Organizational Excellence, Veterans Health Administration. She spoke about Dr. Andrew Balas’ work that showed the time from initial research funding to that research affecting patients is 17 years on average, a time frame that must be accelerated. Dr. Carolyn Clancy from the Veterans Health Administration speaks at the conference on how to leverage best practices for clinical research. Deborah A. Zarin, MD, director of NLM’s ClinicalTrials.gov, indicated that society only permits research in humans when the knowledge produced can be applied generally for future patients and can address important questions that cannot be answered using existing biomedical knowledge. The studies must be consequential. She said that research using data from ClinicalTrials.gov suggests the current clinical research enterprise landscape consists of a mix of consequential and non-consequential studies. To reach the societal goal of increasing the proportion of consequential trials, Zarin said that rules and regulations alone are insufficient and urged all stakeholders to take responsibility for applying and incentivizing quality improvement as a cultural norm. Other speakers included medical researchers from Harvard University, University of Texas MD Anderson Cancer Center, and private industry, as well as patient advocates. The executive managing editor of JAMA: The Journal of the American Medical Association, Annette Flanagin, was among many of the attendees who praised the quality of the discussions and noted NLM is unique in its ability to bring together such viewpoints. Balas, whose research was cited by Clancy, served as a co-chair of the conference planning committee. He is a professor and dean of the College of Allied Health Sciences and director of the Biomedical Research Innovation Laboratory at Augusta University in Georgia. Joining NLM as co-sponsors of the conference were the Friends of the National Library of Medicine and Research!America. July 26, 2017 in Events.